The push for a cashless economy has trickled down to the grassroots, with a community event being the first to feature such payments. 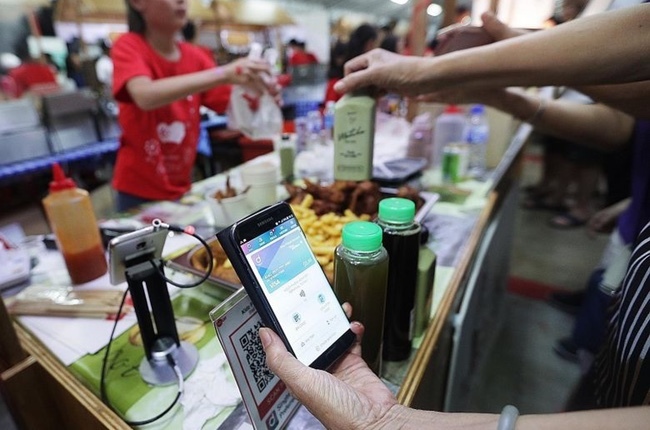 Yesterday, close to 500 elderly residents learnt how to download and use the Singtel Dash mobile payment app at a Yio Chu Kang carnival to purchase food and handmade crafts from young entrepreneurs. The event was organised by Singtel Dash, the Bosses Network Young Chapter, Yio Chu Kang grassroots organisations and the Singapore Agro-Food Enterprises Federation. It was put together by more than 200 grassroots volunteers and 20 community partners. First-time user and shopkeeper Lim Gy-an, 69, said: "I learnt how to use Facebook, now I must learn how to go cashless, otherwise I will be left behind." Prime Minister Lee Hsien Loong, who spoke about achieving a cashless economy as part of Singapore's drive to become a Smart Nation during his National Day Rally speech last year, attended the event. The broad plan ranges from offering the option of cashless payment for every government service in five years to allowing cashless transactions in hawker centres. But on the ground, not everyone has been quick to embrace the cashless movement. At the carnival yesterday, all 10 stalls run by youth entrepreneurs offered cashless payments but only three of 16 stalls run by local farmers did the same. Mr Peter Barber, co-owner of urban farm ComCrop, said he wanted more clarity about the cost of using cashless payment platforms. "I don't want to build up a customer base using a system and find out I have to change it later because the service fees might not make sense to my business model," he said. Meanwhile, Mr Douglas Ng, 27, who owns hawker stall A Fishball Story, offers cashless payments at all his four branches, a necessity since his clientele tends to be young and tech-savvy. However, while mentoring one of the youth entrepreneurs at the fair, he noted that fewer than half the visitors used the app to make payments. "Singaporeans, especially the older folks, are still used to carrying cash so it will take a while to change the mindset," he said. "That's why we need more activities like this to make them more aware." He also spoke of possible cashflow problems for small business owners since some cashless payment options take up to two weeks for funds to be transferred to bank accounts. Singtel head of mobile commerce, Mr Gilbert Chuah, said Dash was committed to attracting the traditionally cash-based merchant. To that end, they are charged a low fee - hawkers, for example, pay 0.3 per cent per transaction compared with some credit card fees of 3 per cent. Funds are also transferred the next day. Despite the reticence of some residents and business owners at the carnival, an MP for Ang Mo Kio GRC, Dr Koh Poh Koon, who is also Senior Minister of State for Trade and Industry, said he was encouraged by the take-up, especially among seniors. "This was encouraging as it showed us that residents, young and old, are willing to try and step out of their comfort zone," he said.